Get ready for a wild, spectacular ride in this new installment in the Mario Kart series, featuring the return of bikes, stunning HD graphics, gravity-defying tracks, and hovercraft-like vehicles! 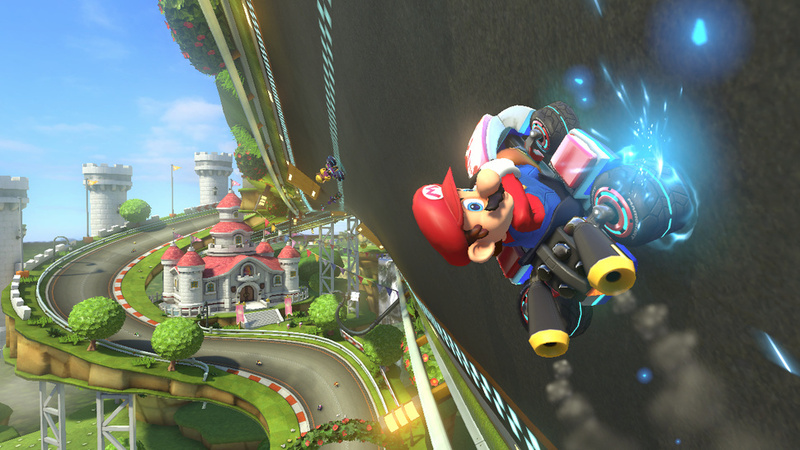 Mario Kart 8 will also feature all the elements from Mario Kart 7 with coins, gliding, and underwater driving. But pretty uninspired. To be honest it's a little like SM3DW... feels like there should be more to say about the game. Hello gamepad? Other than it being a suped up 3DS game. I was pretty disappointed, but I'll reserve my judgement for now. Not too pleased that the bikes are back... It was alright as a novelty for one game, but I was hoping we wouldn't see them again. I really like Mario Kart 7, a lot more than Wii, and at this stage I feel like this could be a step backwards rather than forwards. I can't believe all the people who are complaining about how supposedly uninspired the game looks. Did you not see the anti-gravity parts? What else could you possibly ask for in a new Mario Kart? I mean really, people will find any reason to complain sometimes. I'm very happy with Mario Kart 8, it looks beautiful and anti-gravity is a very innovative feature. I don't care what any of you complainers say, this looks awesome. As one of the harsher critics of the last game, this looks pretty awesome. Also, having features from both the Wii and 3DS game is a good sign to me that this game will actually have decent content instead of taking things out because of time and effort. Mostly wondering what the new multiplayer is like though. Being able to drive on the bottom of the roads was the highlight of the Direct for me. Amid disappointment in general, I've high hopes for this game because it LOOKS excellent. Make it a racer, Nintendo - not a lottery. Made this gif after the direct. Cool; I hope they expand on Mario Kart 7's customization. Video capture sounds like another step up for Miiverse too. I'm hoping its a miiverse feature and not just one for that game. DUDE! THEY USE HOVER KARTS? WE'RE IN THE FUTURE! Hmm, I would have thought 5-player local because 1 could use the GamePad.